This contemporary apartment lies on the edge of Gràcia, a hip district of Barcelona offering many bars, cafés and restaurants nearby to keep you entertained. Close to Gaudí’s Park Güell, you can also benefit from one of the architect’s most famous creations. With a classic neutral colour palette and modern design and furnishings, this apartment offers ultimate comfort. Sleeping up to six people, the spacious apartment has two bathrooms and a large dining and living area where you can enjoy home-cooked meals around the dining table or relax on the sofa with the internet and TV. The kitchen comes complete with all the main amenities you need including a dishwasher, microwave, oven, toaster, coffee maker and even a juicer! 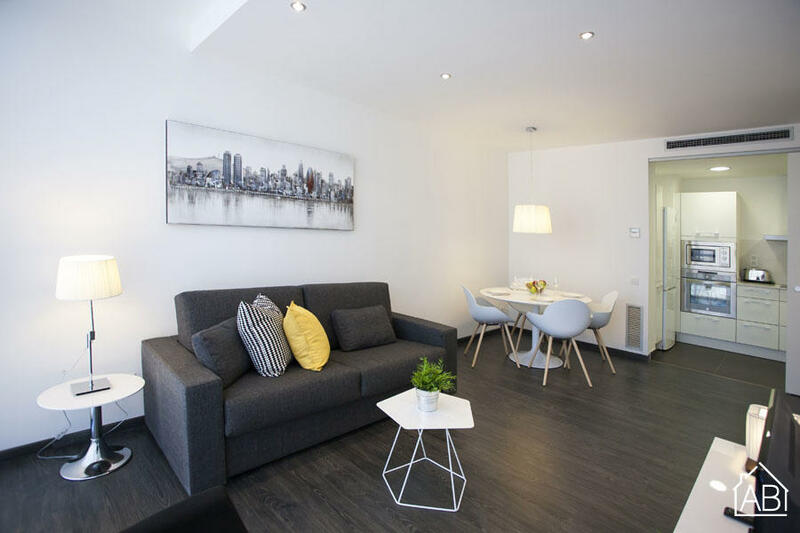 The spacious bedrooms benefit from plenty of natural light from floor to ceiling windows whilst one of the bathrooms offers a large walk-in shower and the other a shower and bath – ideal after a long day in the city! With Lesseps metro station just a stone’s throw away and an elevator and parking, access couldn’t be easier. Furthermore, central heating and air conditioning make this apartment an ideal choice of accommodation in Barcelona any time of year.